Objective: To quantitatively investigate water diffusion changes in normal-appearing white matter (NAWM) and gray matter in patients with MS, and to evaluate whether these changes are correlated with clinical disability and disease duration. Background: Diffusion tensor imaging provides quantitative information about the magnitude and directionality (anisotropy) of water diffusion in vivo and detects pathologic changes in MS brain tissue. Methods: Diffusion tensor imaging was performed in 39 patients with MS and in 21 age-matched control subjects. 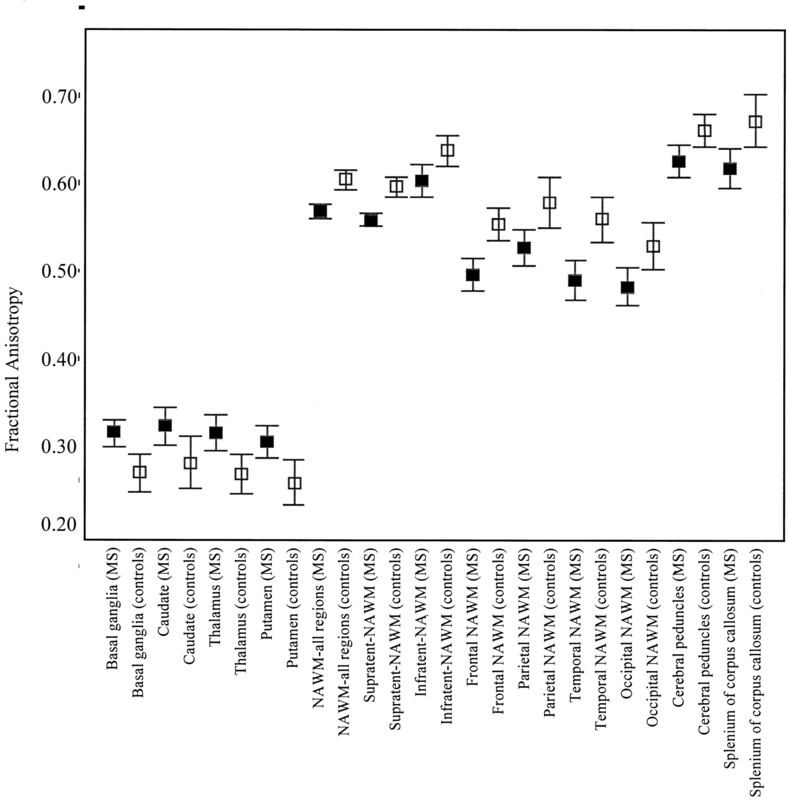 Quantitative indices, including fractional anisotropy, volume ratio, and mean diffusivity, were obtained in 30 regions of interest located in normal-appearing basal ganglia, cerebellar gray matter, and supratentorial and infratentorial NAWM. Results: Patients with MS showed significantly reduced anisotropy and a trend toward increased diffusivity in the infratentorial and supratentorial NAWM, and significantly increased anisotropy in the basal ganglia. In all patients with MS, both fractional anisotropy and mean diffusivity in the cerebral peduncles were inversely correlated with the Expanded Disability Status Scale and pyramidal functional scores. In patients with relapsing-remitting MS, there was a strong correlation between Expanded Disability Status Scale score and fractional anisotropy in both supratentorial and infratentorial NAWM. In primary and secondary progressive MS, disease duration correlated strongly with mean diffusivity in infratentorial NAWM and fractional anisotropy in the cerebral peduncles, respectively. Conclusion: The most striking finding of decreased fractional anisotropy in supratentorial and infratentorial NAWM and increased fractional anisotropy in basal ganglia may result from axonal degeneration due to fiber transection in remote focal lesions. Diffusion tensor imaging indices, in particular fractional anisotropy, appear sensitive to structural damage in NAWM that is associated with disability and progression in MS.
One promising approach depends on detecting changes in the random motion of water molecules (diffusion) in brain tissue. The diffusion behavior of water is affected by pathologic processes, and can be detected and quantified by MRI.7 Previous diffusion imaging studies demonstrated abnormally high diffusion in lesions and NAWM in MS.8-11⇓⇓⇓ However, it is now generally agreed that to more completely describe the motion of water molecules, a mathematical matrix, the diffusion tensor, must be estimated.12 This requires the more sophisticated imaging approach of diffusion tensor imaging (DTI). DTI requires the measurement of the NMR signal with diffusion sensitization along six or more noncollinear directions, allowing the determination of three mutually perpendicular eigenvectors (the magnitudes of which are given by three corresponding eigenvalues). Various mathematical combinations of these three vectors allow the derivation of a number of diffusion indices that are rotationally invariant, i.e., independent of patient position and acquisition method. Therefore, the main advantage of using diffusion tensor indices in clinical studies is that they are reliable, quantitative, and objective measures of the diffusion properties in the human brain. In WM, water molecules diffuse preferentially in the direction parallel to axons, being restricted in perpendicular directions.13 This property, termed diffusion anisotropy, may be quantified by two indices: fractional anisotropy (FA)14 and volume ratio (VR).15 FA increases with anisotropy and provides the most detailed spatial depiction of anisotropic areas. VR decreases with anisotropy and provides the strongest contrast between low- and high-anisotropy areas, but with decreased anatomic detail.16 In general, whereas WM has an oriented microstructure due to similarly aligned fiber tracts with high anisotropy, gray matter (GM) is characterized by less ordered tissue and relatively low anisotropy. Mean diffusivity (MD)14 is another tensor index that measures the magnitude of water diffusion in the tissue without regard to its directionality. MD would therefore not be expected to discriminate between WM and GM. DTI has not been widely applied in patients with MS. Whole-brain diffusion MR histograms have been shown to discern differences between clinical MS subgroups, suggesting that the technique is a promising method to evaluate disease burden.17 Previous studies have demonstrated abnormally low FA and high MD in MS lesions and NAWM,18,19⇓ but did not examine the relationship between DTI abnormalities and clinical disability. Although MS predominantly affects WM regions, lesions also occur in cortical and deep GM.20,21⇓ The functional significance of GM abnormalities is not well established. Studies using PET22,23⇓ and conventional MR imaging techniques24,25⇓ have demonstrated functional and structural abnormalities in normal-appearing GM (NAGM) beyond the focal inflammatory lesions. Furthermore, a recent study reported a correlation between basal ganglia T2 shortening and disability,26 suggesting that basal ganglia abnormalities (possibly relating to iron deposition) might be a marker of disease severity. We therefore used whole-brain DTI to investigate changes in the magnitude and anisotropy of water diffusion in NAWM and NAGM, and to determine the relationship of these indices to clinical disability and disease duration in 39 patients with MS.
Thirty-nine patients with clinically definite MS27 attending the National Hospital for Neurology and Neurosurgery in London were studied. Mean age was 45 ± 11.2 years; median Kurtzke Expanded Disability Status Scale (EDSS)28 score was 4.0 (range, 1.5 to 8.5), median pyramidal score was 2 (range, 0 to 5), and median cerebellar score was 0 (range, 0 to 3). Median disease duration was 13 years (range, 3 to 33). There were 20 men and 19 women. The following MS subgroups were classified according to standard criteria:29 11 benign (median EDSS, 2.0; range, 1.5 to 3.0) with a median disease duration of 20 years (range, 13 to 31); nine relapsing-remitting (RR) (median EDSS, 2.5; range, 1.5 to 5.0) with a median disease duration 7 years (range, 3 to 24); 11 secondary-progressive (SP) (median EDSS, 6.0; range, 3.5 to 8.0) with a median disease duration of 14 years (range, 7 to 33); and eight primary-progressive (PP) (median EDSS, 6.0; range, 5.0 to 8.5) with a median disease duration of 12 years (range, 4 to 18). Twenty-one (14 men and seven women) healthy matched control subjects (mean age, 40.3 ± 9.7 years) were included in the study. Informed consent was obtained from all subjects before entry into the study. All images were displayed on a Sun workstation (Sun Microsystems, Mountain View, CA) using the DispImage software package.30 Thirty square regions of interest (ROI) of uniform size (nine pixels; 31.72 mm2) were placed bilaterally in 14 different anatomic regions, and in the middle of the genu and splenium of the corpus callosum, in each subject. Supratentorial and infratentorial regions were defined as the areas located above and below the tentorium of cerebellum. The ROI were outlined on the nondiffusion-weighted b0 (b = 0) images of the DW-EPI dataset, with guidance from corresponding slices of the T2-weighted and proton density–weighted images to ensure that lesions were avoided. The ROI were automatically transferred to the FA, VR, and MD maps and visually checked by the observer (O.C.) in order to confirm their location and to ensure that partial volume effects were minimized. The mean value, SD, and range of diffusion parameters within each ROI were automatically recorded. To ensure similar SNR in patients and control subjects, permitting a valid statistical comparison, the degree of noise contamination was determined by locating a ROI outside the brain (and away from any imaging artifacts) on the b0 images. For each ROI on the b0 images, the SNR was calculated as SNR = S(b0)/ς, where S(b0) is the mean of the signal intensity in each region and ς is the mean of the noise in the region outside the brain. The average values of FA, VR, and MD within each subject for each anatomic region were calculated. For bilateral ROI, e.g., the anterior limb of internal capsule, the values of each diffusion parameter from left and right ROI were averaged to give a single figure per patient. The values of each diffusion parameter of all ROI located in the supratentorial and infratentorial NAWM and basal ganglia areas were averaged to provide one value for each of these areas. To compare patients with MS and control subjects the Mann–Whitney U test was used. 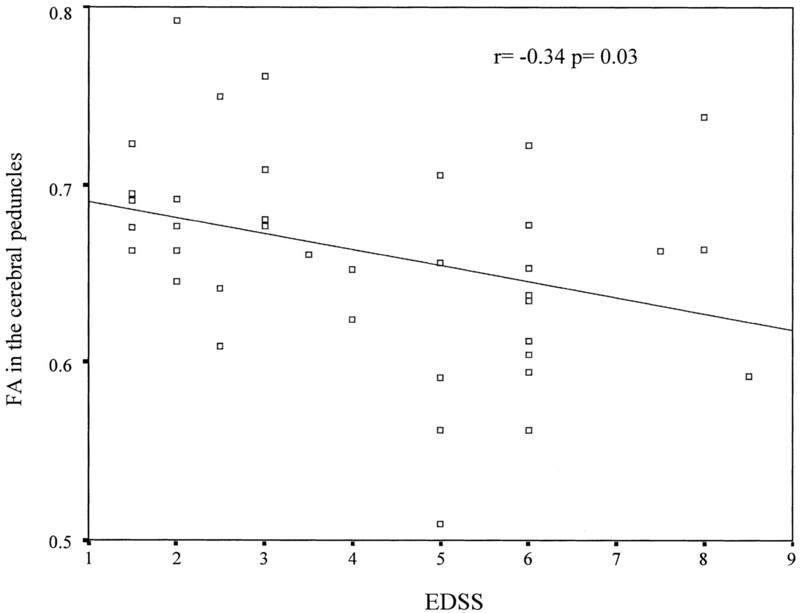 The relationship between diffusion parameters and EDSS, pyramidal, and cerebellar functional scores and disease duration was assessed using Spearman’s correlation coefficient. SNR for each anatomic region between control subjects and patients with MS was compared using the Mann–Whitney U test. Because this was an exploratory study, a multiple comparison adjustment was not performed; the p values indicate differences requiring further, definitive, investigation. An example of some of the ROI located in the NAWM and NAGM on the FA map is shown in figure 1B. The median FA values for each NAWM and GM region are summarized in table 1. Figure 1. (Top) (A) Proton density–weighted images, (B) fractional anisotropy (FA) map, and (C) mean diffusivity (MD) map. Regions of interest (ROI) are placed in the anterior limb, genu, and posterior limb of internal capsule, caudate nucleus, putamen, thalamus, genu, and splenium of corpus callosum. (Bottom) (A) Proton density–weighted images, (B) FA map, and (C) MD map. ROI are placed in the cerebral peduncles. FA was lower in patients with MS than control subjects in all the supratentorial NAWM ROI combined (p < 0.0001) and in the infratentorial NAWM (p = 0.01). Interestingly, FA in the cerebral peduncles was lower in patients with MS compared with control subjects (p = 0.02). Considering the GM regions, patients with MS showed higher FA in the basal ganglia than control subjects (p = 0.002); the most marked differences were in the putamen (p = 0.002) and thalamus (p = 0.003). The ROI in the NAGM and NAWM that show a significant difference in FA between the two groups are illustrated in figure 2. Figure 2. Fractional anisotropy (FA) in the regions of normal-appearing white matter and in the basal ganglia that show a significant difference between patients with MS and control subjects (Co). Boxes represent the mean value, bars 95% CI. Supratent = supratentorial; infratent = infratentorial; c. callosum = corpus callosum. In all patients with MS, FA in the cerebral peduncles correlated with EDSS (r = −0.34; p = 0.03) ( figure 3) and with pyramidal functional score (r = −0.32; p = 0.05). Other regions in the pyramidal tract, including the posterior limb of the internal capsule, did not show a significant correlation with the functional score. FA in the infratentorial NAWM showed an inverse correlation with disease duration (r = −0.39; p = 0.01). FA in the NAGM did not correlate with cerebellar functional score. Figure 3. Scatter plot of fractional anisotropy (FA) in the cerebral peduncles vs the Expanded Disability Status Scale (EDSS) (Spearman’s correlation coefficient, r = −0.34; p = 0.03) in all patients with MS. The line represents the linear regression of the data. When the MS subgroups were considered separately, patients with RRMS showed a strong correlation between EDSS and FA in the supratentorial NAWM (r = −0.68; p = 0.04) ( figure 4) and in the infratentorial NAWM (r = −0.81; p = 0.008) ( figure 5). Patients with SPMS showed a correlation between FA in the cerebral peduncles and disease duration (r = −0.75; p = 0.008). Figure 4. 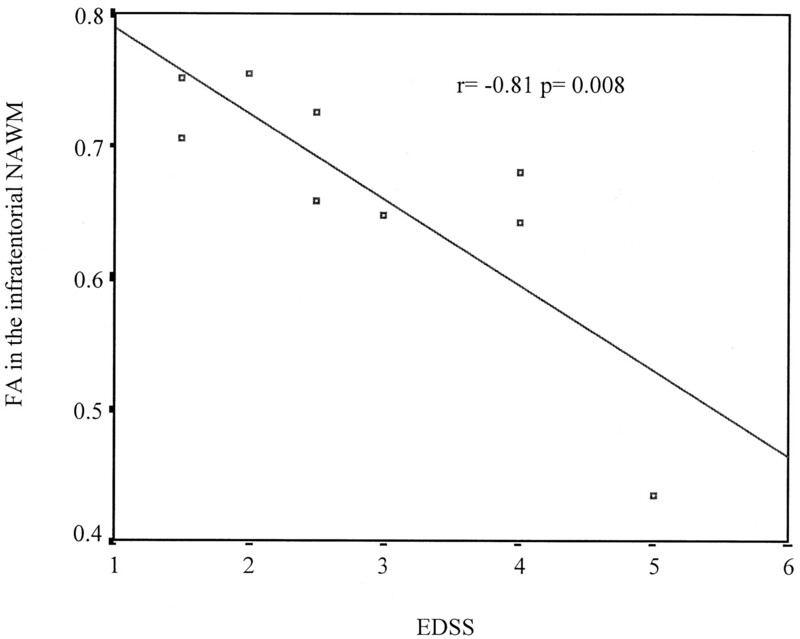 Scatter plot of fractional anisotropy (FA) in the supratentorial normal-appearing white matter vs the Expanded Disability Status Scale (EDSS) (Spearman’s correlation coefficient, r = −0.68; p = 0.04) in patients with relapsing-remitting MS. The line represents the linear regression of the data. Figure 5. Scatter plot of fractional anisotropy (FA) in the infratentorial normal-appearing white matter vs the Expanded Disability Status Scale (EDSS) (Spearman’s correlation coefficient, r = −0.81; p = 0.008) in patients with relapsing-remitting MS. The line represents the linear regression of the data. The median values of VR for each NAWM and GM region are summarized in table 1. There was a difference in VR between patients and control subjects in all the supratentorial NAWM ROI combined (p < 0.0001) and in the infratentorial NAWM (p = 0.007), as well as in the basal ganglia (p = 0.002). In all patients with MS, there was a positive trend between VR in the cerebral peduncles and pyramidal score (r = 0.29; p = 0.08), supporting the FA findings. VR in the infratentorial NAWM showed a correlation with disease duration (r = 0.32; p = 0.04). 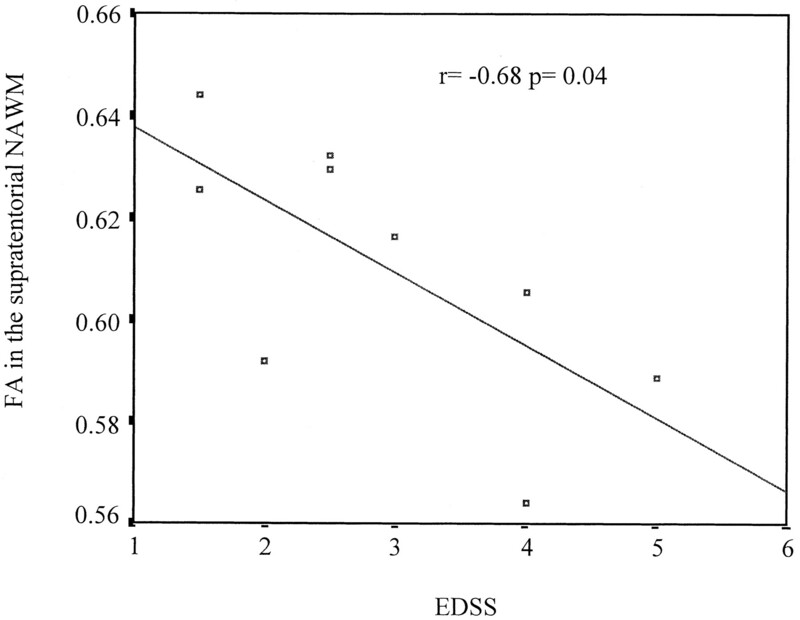 Patients with RRMS showed a strong correlation between EDSS and VR in the infratentorial NAWM (r = 0.84; p = 0.005). An example of some ROI located in the NAWM and in the NAGM on MD map is shown in figure 1C. The median values of the MD for each NAWM and GM region are summarized in table 1. MD in all the NAWM ROI combined was slightly higher in patients with MS than control subjects (p = 0.09) and only the frontal lobes and the splenium of the corpus callosum showed a significant difference between the two groups. Within the GM regions, MD in the putamen was lower in patients with MS compared with control subjects (p = 0.02). In all patients with MS, there were inverse correlations between MD in the cerebral peduncles and both EDSS (r = −0.32; p = 0.05) ( figure 6) and pyramidal score (r = −0.36; p = 0.02). MD in the other regions of NAWM and NAGM did not correlate with disease duration or cerebellar score. Patients with PPMS showed a strong correlation between disease duration and MD in the infratentorial NAWM (r = −0.86; p = 0.006). Figure 6. 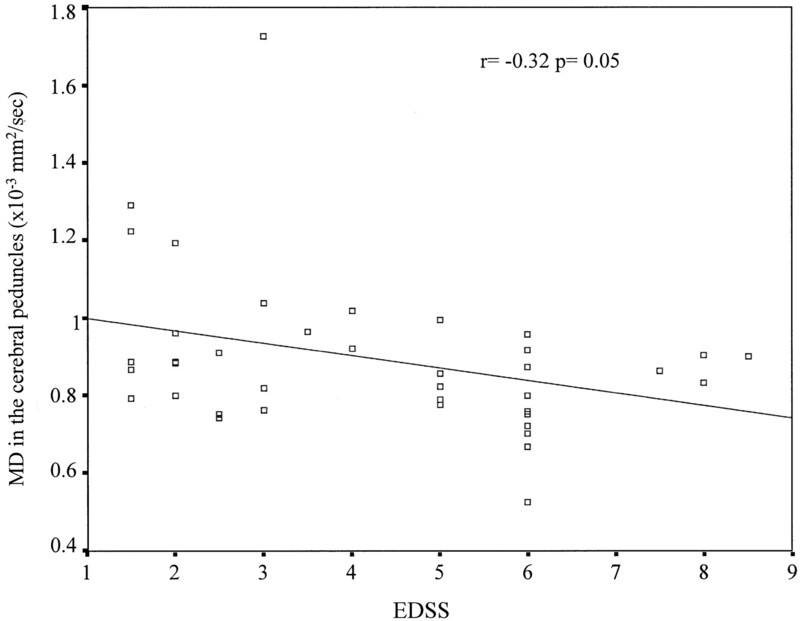 Scatter plot of mean diffusivity (MD) in the cerebral peduncles vs the Expanded Disability Status Scale (EDSS) (Spearman’s correlation coefficient, r = −0.32; p = 0.05) in all patients with MS. The line represents the linear regression of the data. Strong correlations between the two anisotropy indices (FA and VR) were seen in patients in all the NAWM ROI combined (r = −0.95; p < 0.0001) and in the basal ganglia (r = −0.99; p < 0.0001) as well as in control subjects (r = −0.96; p < 0.0001 and r = −0.99; p < 0.0001). Although MD and FA in the supratentorial NAWM were correlated in both the control group (r = −0.50; p = 0.02) and the patient group (r = −0.38; p = 0.02), no correlation was found between these two diffusion parameters in the basal ganglia and cerebral peduncles. No differences in diffusion parameters were observed between the MS subgroups, including a comparison of patients with PPMS with all other relapse onset patients. Mean SNR calculated on the b0 images were as follows: in patients, 39.3 ± 5.7 for all NAWM regions and 40 ± 6.4 in basal ganglia; in control subjects, 37.3 ± 3.8 for all NAWM regions and 40.7 ± 4.1 in basal ganglia. SNR were not significantly different between the two groups. The SNR for the other anatomic regions studied showed no difference between patients with MS and control subjects. DTI provides information to quantify the magnitude and the directionality (anisotropy) of the diffusion of water molecules in vivo13,14⇓ and to investigate the pathologic changes occurring in the brains of patients with MS.18,19⇓ In particular, the assessment of the anisotropy indices allows in vivo assessment of the structural integrity and directional coherence of fiber tracts in the NAWM.15 The present study indicates that the corpus callosum, cerebral peduncles, and internal capsule are the regions with the highest degree of anisotropy, indicating that they are characterized by an ordered and parallel arrangement of fibers.31,32⇓ The basal ganglia and cerebellar GM also appear to show some degree of anisotropy33 that may in part be explained by the origin or termination of myelinated fiber tracts, or by intrinsic neuronal connections. In agreement with previous studies,18,19⇓ the present results confirm that anisotropy, assessed here by two complementary tensor indices, is significantly lower in the NAWM of patients with MS compared with the WM of control subjects. The reduction of anisotropy was apparent in almost all areas of NAWM studied, both supratentorially and infratentorially. These differences in anisotropy between patients and control subjects appear to be genuine and not affected by noise contamination, because the SNR of corresponding ROI was not significantly different. In contrast to previous reports,11,18,19,34⇓⇓⇓ however, MD was not significantly higher when all the NAWM regions in the MS group were combined, although it was significantly increased in the frontal lobes and in the splenium of the corpus callosum. By considering the findings from previous pathologic studies,35,36⇓ an attempt can be made to interpret these changes in diffusion indices in MS NAWM. The NAWM is affected by several pathologic processes: 1) edema associated with inflammation, which could increase the diffusivity; 2) axonal loss that may result in an expanded extracellular space,37 which increases diffusivity but which also reduces the directionality (anisotropy) of water molecules; and 3) gliosis, a disorganized and dense pathologic process, which could reduce both anisotropy and diffusivity. The overall pattern of reduced FA and preserved MD could therefore represent a combination of axonal loss (which reduces FA and increases MD) and gliosis (which reduces both FA and MD). This pattern detected in the cerebral peduncles is similar to that recently reported in the corticospinal tract distal to cerebral infarction using DTI,38 and may be due to Wallerian degeneration39,40⇓ from lesions in connected brain regions. Studies correlating pathology with DTI parameters in NAWM are needed to further elucidate the in vivo findings. The lack of a significant overall increase in MD in all NAWM regions could also be explained by a population with less disease activity than those previously reported,11,18,19,34⇓⇓⇓ also with less lesion activity, the presence of which has been associated with increased diffusion in remote NAWM,39 possibly due to subtle edema and inflammation.41 Furthermore, the current cohort had a longer disease duration than those investigated previously11,18,19,34⇓⇓⇓ and thus may have had more gliosis in the NAWM per se. Alternatively, the approach used in the current study might have underestimated subtle differences between the two groups, because unlike previous studies,11,18,19,34⇓⇓⇓ the values of diffusion parameters obtained within individuals’ ROI were not considered as independent observations. Rather, the data from all ROI in the same subject were pooled into one mean observation. Although MS is predominantly a WM disease, it also involves cortical and deep GM.20,21⇓ DTI has not previously been used to investigate the GM structures in MS. Our analysis included the basal ganglia and the cerebellar GM, but not the cerebral cortex, because the latter appeared significantly affected by the partial volume of CSF in the cortical sulci, which might easily contaminate diffusion measurements. There was a trend toward a lower MD in the basal ganglia of patients with MS, which was statistically significant only in the putamen. The basal ganglia are important components of cortical–subcortical circuits, including the motor circuit that links the supplementary motor area, premotor, and sensorimotor cortex to the putamen, which then projects to the thalamus and back to the cortex.42 Previous PET studies investigating regional glucose metabolism reported hypometabolism in the basal ganglia, suggesting that damage to the connection fibers can cause a remote functional metabolic effect on subcortical nuclei (diaschisis).22,23,43⇓⇓ This disturbance of metabolism may cause restricted diffusion, as has been reported in experimental studies of focal ischemia and status epilepticus.44,45⇓ These studies raise the possibility that damage of the neural connections in MS could induce a metabolic dysfunction in the basal ganglia that slightly decreases the MD. More impressively, FA in all basal ganglia nuclei examined was significantly higher in patients with MS than control subjects. The basal ganglia nuclei are connected to each other by intrinsic connections,42 which show anisotropy.33 If the WM fibers that connect cortical areas with the basal ganglia are selectively affected by Wallerian degeneration or by neuronal dysfunction (diaschisis), the intact intrinsic connections could show an increase of their coherence. This underlying structure may in effect be “unmasked” by damage to cortical–subcortical projections. A recent study suggested that T2 shortening in the basal ganglia (possibly due to local iron deposition) can be used as a marker of disease severity in MS.25 Although local iron deposition could in theory increase field disturbance and as a consequence affect the anisotropy values, we do not think this can explain the observed difference in anisotropy, as no difference in the SNR of basal ganglia ROI was found between patients and control subjects. The observation that anisotropy and diffusivity did not correlate with each other in the basal ganglia suggests that in these regions they may be sensitive to different pathologic aspects of the disease. Although other MR techniques have already been successful in correlating NAWM damage and MS disability,2,4-6⇓⇓⇓ to date the clinical relevance of DTI changes in NAWM is not well known. In the present study, when the MS subgroup were considered separately, three strong correlations were observed: 1) between EDSS and FA in both the supratentorial and infratentorial NAWM in patients with RRMS; 2) between disease duration and FA in the cerebral peduncles in patients with SPMS; and 3) between disease duration and MD in the infratentorial NAWM in patients with PPMS. Moreover, if results from all patients with MS are combined, both FA and MD in the cerebral peduncles inversely correlated with EDSS and pyramidal functional score, albeit modestly. Overall, these clinical correlations suggest that the pathologic damage detected on DTI in NAWM regions, including the pyramidal tract, is a significant factor contributing to disability and progression in MS. However, the study was of a relatively small cohort and evaluated normal-appearing tissue only. In order to specify the relative contributions of MS lesions and normal-appearing brain tissue to clinical course and disability, studies with DTI in larger cohorts are needed. In addition to ROI analysis, these studies should also employ methods such as histogram analysis, which provides a more global assessment of the normal-appearing tissues. Supported by MS Society of Great Britain and Northern Ireland. O.C. is supported by International Federation of MS Societies. The authors thank C.A. Clark and F. Franconi for the implementation of diffusion tensor imaging; M. King for advice on the statistical analysis; D.G. MacManus and A.S. Lowe for technical assistance with the MR scan; and C.M.B. Griffin, D.T. Chard, and P.A. Brex for providing some of the patient and control subject data. Miller DH, Grossman RI, Reingold SC, McFarland HF. The role of magnetic resonance techniques in understanding and managing multiple sclerosis. Brain . 1998; 121: 3–24. Filippi M, Campi A, Dousset V, et al. A magnetization transfer imaging study of normal-appearing white matter in multiple sclerosis. Neurology . 1995; 45: 478–82. Davie CA, Barker GJ, Thompson AJ, Tofts PS, McDonald WI, Miller DH. 1H magnetic resonance spectroscopy of chronic cerebral white matter lesions and normal appearing white matter in multiple sclerosis. J Neurol Neurosurg Psychiatry . 1997; 63: 736–742. Davie CA, Barker GJ, Webb S, et al. Persistent functional deficit in multiple sclerosis and autosomal dominant cerebellar ataxia is associated with axonal loss. Brain . 1995; 118: 1583–1592. Fu L, Matthews PM, De Stefano N, et al. Imaging axonal damage of normal-appearing white matter in multiple sclerosis. Brain . 1998; 121: 101–103. Sarchielli P, Presciutti O, Pelliccioli GP, et al. Absolute quantification of brain metabolites by proton magnetic resonance spectroscopy in normal-appearing white matter of multiple sclerosis patients. Brain . 1999; 122: 513–521. LeBihan D, Turner R, Doveck P, Patronas N. Diffusion MR imaging: clinical applications. AJR Am J Roentgenol . 1992; 159: 591–599. Larsson HBW, Thomsen C, Frederiksen J, Stubgaard M, Henriksen O. In vivo magnetic resonance diffusion measurement in the brain of patients with multiple sclerosis. Magn Reson Imaging . 1992; 10: 7–12. Christiansen P, Gideon P, Thomsen C, Stubgaard M, Henriksen O, Larsson HBW. Increased water self-diffusion in chronic plaques and in apparently normal white matter in patients with multiple sclerosis. Acta Neurol Scand . 1993; 87: 195–199. Horsfield MA, Lai M, Webb SL, et al. Apparent diffusion coefficient in benign and secondary progressive multiple sclerosis by nuclear magnetic resonance. Magn Reson Med . 1996; 36: 393–400. Filippi M, Iannucci G, Cercignani M, Rocca MA, Pratesi A, Comi G. A quantitative study of water diffusion in multiple sclerosis lesions and normal-appearing white matter using echo-planar imaging. Arch Neurol . 2000; 57: 1017–1021. Basser PJ, Mattiello J, LeBihan D. Estimation of the effective self-diffusion tensor from the NMR spin echo. J Magn Reson B . 1994; 103: 247–254. Pierpaoli C, Jezzard P, Basser PJ, Barnett A, Di Chiro G. Diffusion tensor MR imaging of the human brain. Radiology . 1996; 201: 637–648. Basser PJ, Pierpaoli C. Microstructural and physiological features of tissues elucidated by quantitative-diffusion-tensor MRI. J Magn Reson B . 1996; 111: 209–219. Papadakis NG, Xing D, Houston GC, et al. A study of rotationally invariant and symmetric indices of diffusion anisotropy. Magn Reson Imaging . 1999; 17: 881–892. Nusbaum AO, Tang CY, Wei TC, Buchsbaum MS, Atlas SW. Whole-brain diffusion MR histograms differ between MS subtypes. Neurology . 2000; 54: 1421–1426. Werring DJ, Clark CA, Barker GJ, Thompson AJ, Miller DH. Diffusion tensor imaging of lesions and normal-appearing white matter in multiple sclerosis. Neurology . 1999; 52: 1626–1632. Bammer R, Augustin M, Seifert T, et al. Magnetic resonance diffusion tensor imaging for characterizing diffusion and focal white matter abnormalities in multiple sclerosis. Magn Res Med . 2000; 44: 583–591. Brownell B, Hughes JT. The distribution of plaques in the cerebrum in multiple sclerosis. J Neurol Neurosurg Psychiatry . 1962; 25: 15–320. Kidd D, Barkhof F, McConnell R, Algra PR, Allen IV, Revesz T. Cortical lesions in MS. Brain . 1999; 122: 17–26. Paulesu E, Perani D, Fazio F, et al. Functional basis of memory impairment in multiple sclerosis: a 18F-FDG PET study. Neuroimage . 1996; 4: 87–96. Bakshi R, Miletich RS, Kinkel PR, Emmet ML, Kinkel WR. High-resolution fluorodeoxyglucose positron emission tomography shows both global and regional cerebral hypometabolism in multiple sclerosis. J Neuroimaging . 1998; 8: 228–234. Grimaud J, Millard J, Thorpe JW, Moseley IF, McDonald WI, Miller DH. Signal intensity on MRI of basal ganglia in multiple sclerosis. J Neurol Neurosurg Psychiatry . 1995; 59: 306–308. Russo C, Smoker WRK, Kubal W. Cortical and subcortical T2 shortening in multiple sclerosis. Am J Neuroradiol . 1997; 18: 124–126. Bakshi R, Shaikh ZA, Janardhan V. Magnetic resonance imaging T2 shortening in multiple sclerosis brains (black T2 lesions): a new surrogate marker of disease. Ann Neurol . 1999; 46: 469–470. Poser CM, Paty DW, Scheinberg L, McDonald WI, Davis FA, Ebers GC. New diagnostic criteria for multiple sclerosis: guidelines for research protocols. Ann Neurol . 1983; 13: 227–231. Kurzke JF. Rating neurologic impairment in multiple sclerosis: and Expanded Disability Status Scale (EDSS). Neurology . 1983; 33: 44–52. Plummer DL. DispImage: a display and analysis tool for medical images. Riv Neuroradiol . 1992; 5: 489–495. Peled S, Gudbjartsson H, Westin CF, Kikinis R, Jolesz F. Magnetic resonance imaging shows orientation and asymmetry of white matter fiber tracts. Brain Res . 1998; 780: 27–33. Virta A, Barnett A, Pierpaoli C. Visualizing and characterizing white matter fiber structure and architecture in the human pyramidal tract using diffusion tensor imaging. Magn Reson Imaging . 1999; 17: 1121–1133. Wiegell MR, Tuch DS, Larsson HBW, Wedeen VJ. Angular differentiation of thalamic nuclei by quantitative DTI. Proc Int Soc Magn Reson Imag Med . 2000; 8: 481.Abstract. 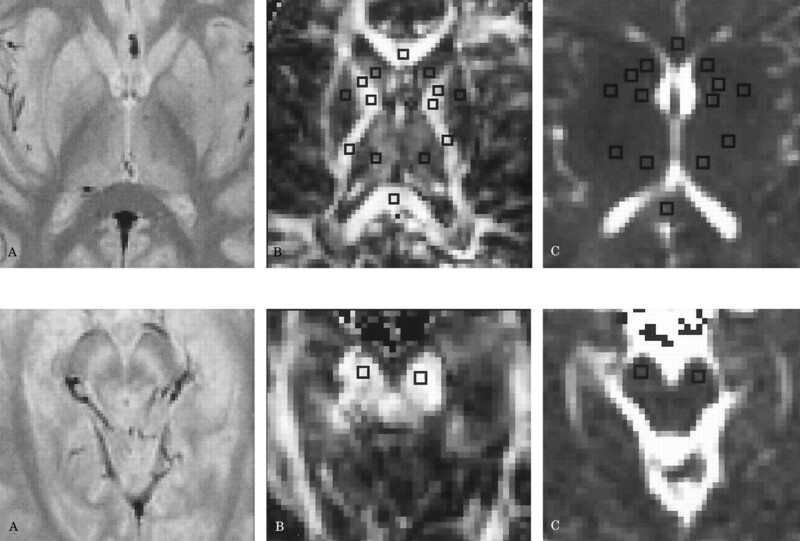 Cercignani M, Iannucci G, Rocca MA, Comi G, Horsfield MA, Filippi M. Pathological damage in MS assessed by diffusion-weighted and magnetization transfer MRI. Neurology . 2000; 54: 1139–1144. Allen I, McKeown S. A histological, histochemical and biochemical study of the macroscopically normal white matter in multiple sclerosis. J Neurol Sci . 1979; 41: 81–91. Evangelou N, Esiri MM, Smith S, Palace J, Matthews P. Quantitative pathological evidence for axonal loss in normal-appearing white matter in multiple sclerosis. Ann Neurol . 2000; 47: 391–395. Barnes D, Munro PM, Youl BD, Prineas JW, McDonald WI. The longstanding MS lesion. A quantitative MRI and electron microscopic study. Brain . 1991; 114: 1271–1280. Werring DJ, Toosy AT, Clark CA, et al. Diffusion tensor imaging can detect and quantify corticospinal tract degeneration after stroke. J Neurol Neurosurg Psychiatry . 2000; 69: 269–272. Werring DJ, Brassat D, Droogan AG, et al. The pathogenesis of lesions and normal-appearing white matter changes in multiple sclerosis. Brain . 2000; 123: 1667–1676. Simon JH, Kinkel RP, Jacobs L, Bub L, Simonian N. A Wallerian degeneration pattern in patients at risk for MS. Neurology . 2000; 54: 1155–1160. Moreau T, Coles A, Wing M, et al. Transient increase in symptoms associated with cytokine release in patients with multiple sclerosis. Brain . 1996; 119: 225–237. Alexander GE, Crutcher MD, De Long MR. Basal ganglia thalamocortical circuits: parallel substrates for motor, oculomotor, “prefrontal” and “limbic” functions. In: Uylings HBM, Van Eden CG, De Bruin JPC, Corner MA, Feenstra MGP, eds. Progress in brain research. Amsterdam: Elsevier 1990: 119–146. Roelcke U, Kappos L, Lechner–Scott J, et al. Reduced glucose metabolism in the frontal cortex and basal ganglia of multiple sclerosis patients with fatigue: a 18F-fluorodeoxyglucose positron emission tomography study. Neurology . 1997; 48: 1566–1571. Wang Y, Majors A, Najm I, et al. Postictal alteration of sodium content and apparent diffusion coefficient in epileptic rat brain induced by kainic acid. Epilepsia . 1996; 37: 1000–1006. Thornton JS, Ordidge RJ, Pernice J, et al. Anisotropic water diffusion in white matter and gray matter of the neonatal piglet brain before and after transient hypoxia-ischaemia. Magn Reson Imaging . 1997; 15: 433–440.